The ULTra PRT (Personal Rapid Transit) is back in the news (see ULTra - driverless automatic taxi), this time in London's Heathrow Airport. They will be used to connect Heathrow's Terminal 5 with a parking lot. 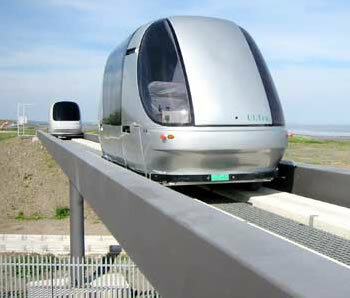 ULTra PRT uses magnets and sensors in the ground for guidance; these "driverless taxis" are fully automated. The idea of an autonomous taxicab has been around for a while; take a look at the tin cabbie from James Blish's 1957 novel Cities in Flight. Read more about Driverless taxis of the future.